You might have noticed our crafts are transitioning toward Thanksgiving. Our history lessons, and reading are, too. This time of year we tend to fall naturally into a study of early American history. This year though, after enjoying a little pre-Columbus Day foray into the voyages of the Vikings. I'm hoping to cover more with the children, than the usual Plymouth fare. I'm thinking conquistadors, and early Indian slave trade (Squanto couldn't have been the only one captured, and taken off to Europe), and some of the non-English colonies, early in the country's forming. Finding good books for children, on this time period, has proved challenging. I have a few ordered in at the library, but for the most part, the choices were dismal, and disheartening. I did happen onto a radio interview of Tony Horwitz, on YouTube, discussing his book A Voyage Long and Strange: Rediscovering the New World. It is not written for children, but it does seem to cover exactly what I was looking for. So, it's become our family read-aloud for the month. So far, we've made it through the prologue in which Mr. Horwitz promises to take us on a journey through some of the lesser studied parts of the American past, and the first two chapters, about the Vikings, and Columbus. It's part travelogue, part history book, and written in a very accessible, conversational style, that so far, has kept the entire family engaged (as long as the little ones have coloring sheets). It is not written for children however, and the language from time to time, is colorful - but nothing that the careful reader can't sidestep. So, while it's not one I'd give to the children to read alone, it has made for some interesting, and entertaining evenings, together. 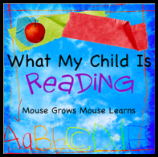 Find out what other families are reading, at this week's What My Child is Reading blog-hop, hosted by Mouse Grows, Mouse Learns. Sounds interesting. I have put it on my wish list. Thanks for joining WMCIR! I added this book to my "for later" list. I agree with you that it's hard to find appropriate books on early American history. I asked Anna today what she knows about Thanksgiving and, sadly, she managed two things - "grandparents are coming" and "turkey dinner".